I don’t know why everyone calls this a tea. There is no tea to be found in this great drink for your body. If you do a search on ginger, turmeric and lemon tea you will find tons of blogs with varying recipes. The blog that I first looked at even used Cayenne. Nope not me!! A lot of the recipes say that you can used powered ginger and turmeric. Take it from me DON’T. It is horrid and it does not dissolve. There are many benefits to consuming ginger and turmeric and the number one reason I am beginning to use this tea is for inflammation. I was diagnosed with fibromyalgia several years ago and recently have heard a lot about taking turmeric with this condition. I already juice ginger with my other fruits and veggies in the morning but wanted something to drink during the day as I dislike drinking water all by its lonesome. Maybe some day I will enjoy it. Some of the benefits of ginger are pain relief of arthritis, low back pain, stomach upset (even caused by cancer) and more. Here is the link to WebMD which also lists side effects. Some of the benefits of turmeric are the same as ginger but include Alzheimers, water retention and worms. Here is the link to WebMD which also lists side effects. I juiced the lemons along with the ginger and turmeric. 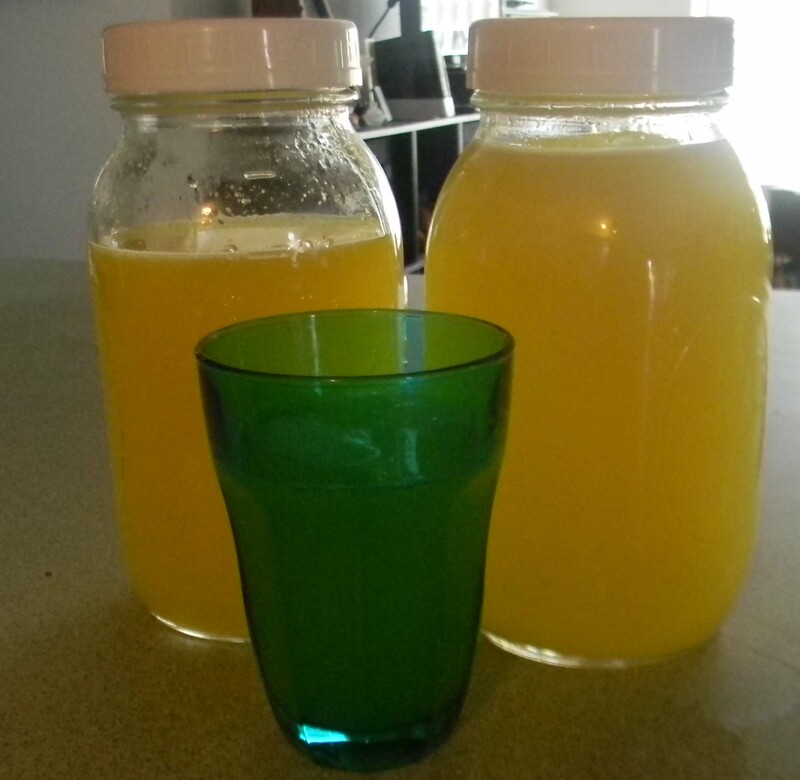 I divided this mixture into 2 quart jars and added filtered water. I then added a T of raw sugar into each jar. I will add my local honey next time for extra benefit. Mix and enjoy. This entry was posted in Drinks, Food and Drink, Medical, Posts. Bookmark the permalink.